We were asked my numerous readers how to write a resignation letter. Ask no more, because that’s exactly what we’re going to cover in this article. We’ll show you how to write a resignation and we’ll give you 20 resignation letter samples and templates. You can use our resignation examples and make the first step to a better career. People resign from work for different reasons. Some resign because they found better career opportunities elsewhere. Others have had enough of their contemptuous relationship with management. And there are those who simply could not handle the stress of the job anymore. Regardless of the reasons or circumstances, resignation will always be a turning point because it represents a change in our lives. The act involves managing outcomes when relationships forged through shared periods of triumphs and failures are about to end. Whether the relationships were contentious or not, a person who is a true professional will always aspire to moderate differences by resigning with honor and dignity. These qualities are best encapsulated and represented by your Letter of Resignation. Should I talk to my immediate supervisor first? Should I e-mail my resignation letter? A Letter of Resignation is no different than any other type of business letter in terms of structure. It has an introduction, a body and a conclusion. But as in all forms of written communication, the challenge lies in the content. The difficulty in crafting a resignation letter is that the act is initiated by powerful emotions; some of which have accumulated over a period of time and attained critical mass. The resignation letter should not be used as a medium to vent your misgivings about your former employer because it will serve no other purpose except to feed your ego. There is a saying in business that you should “never burn your bridges”. There may come a point in time when you will need your former employer’s assistance. You can never go wrong with simplicity because it doesn’t open you up to controversy. Leave out issues that have nothing to do with your resignation. The details regarding your resignation will have their proper venue in the Exit Interview. I have included resignation letter samples that you can review and use as a template. However, if during the course of crafting your letter of resignation you find emotions overcoming the content of the resignation letter template take the time to breathe, relax and review what you have written so far. If the content reads too emotional, discard it and start all over again. Sometimes emotion can get the best of us and overrule sound judgment. Remember, once you have tendered your resignation letter, you can never take it back. The addressee of the letter; usually your direct manager or supervisor with a copy furnished to Human Resources. If required, include the provision in your employment contract that validates your decision to resign. The specific date your resignation will take effect. A brief but official statement on your decision to resign. Lastly, an important but oftentimes difficult component for most resigning employees to include in their letter is a section which expresses appreciation to management and the company during the time of employment. This section is important because it exudes your level of professionalism, maintains the positive nature of the content and is a great way to put closure on your tenure. Once you have reviewed your resignation letter and have signed both the original and receiving copy now comes the time to officially tender it in your office. It would be advisable to resign on a Friday because the work week has come to an end and management is more compassionate approaching the weekend. While it is not mandatory, in terms of proper work etiquette, yes, you should talk to your immediate supervisor first. It shows a sign of respect and appreciation for the camaraderie shared during your term of employment. No. As a matter of professional courtesy, always hand-carry your resignation letter. Give your manager the benefit of a formal audience and a handshake. It would also be a opportune time to receive honest; quite possibly, candid feedback from your superior. 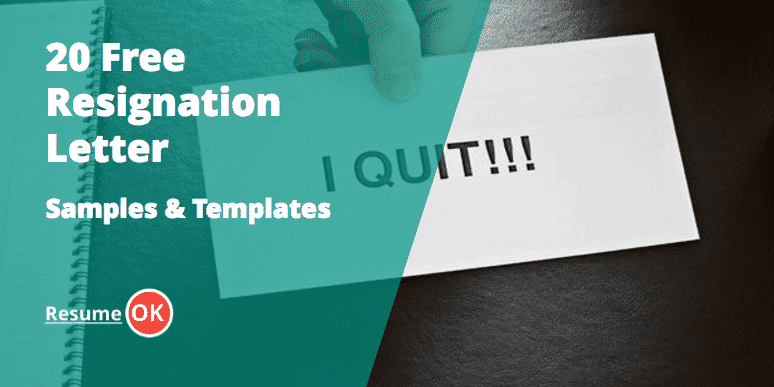 After you’ve processed these ideas on conducting your resignation, you may now proceed to view the free resignation samples we’ve included for your reference and guidance. In the opening paragraph, state right away your intention to resign from the company. It is not required to indicate your reason(s) for resigning as these can be discussed in detail in the Exit Interview. If you feel that you must, keep it short and avoid any emotional overtones or negative connotations in the content. The standard introduction usually begins with “I am writing to inform you” but if you feel more comfortable with your own introduction, go ahead and use it. In the second paragraph, indicate details regarding your transition. These include your last day at the office; pending work that needs to be turned over, period for obtaining clearance and your contact details should the company seek clarification on other matters. In the final paragraph, express regret for any inconvenience your resignation may have caused management and the company. Most importantly, declare your appreciation for the time spent with the company and to wish them well in the years ahead. Closing your resignation on a positive note will extinguish any ill will and helps both parties set out on a fresh start. Use the pagination below to go to the next resignation letter samples and templates.